Specifications – 3.25″ blade; Thickness: .100″; Overall Length: 7.65″; Closed: 4.40″; Weight: 3.00 oz; ATS-34 stainless steel blade hardened to (59-61 HRC); Double, 410 stainless steel liners, G-10 scales; Removable, black steel carry-clip. Benchmade knives ooze with the knife-maker’s obsession. Every detail, angle and material selection reveals intention and purpose. Nothing on a Benchmade is there “because that’s the way we’ve always done it.” Benchmade pays special attention to using only high quality, high performance components and materials in their knives. For those of us who really use our cutlery, this attention to detail and quality components pays off. I did read of one Marine who managed to break the tip of an AFCK while trying to pry something out of the tire of a Chinook, but I don’t have a problem with that. Steel hard enough to take a good edge is brittle enough to break if sufficient lateral force is applied. “AFCK” stands for “Advanced Folding Combat Knife.” In an unbelievable, lawyer-inspired wuss-out, Benchmade is attempting to rename the AFCK “the Advance Folding Camp Knife.” Yeah, right. I guess you need a fast opening, liner-lock, black teflon coated, combo edge clip knife designed by a SEAL in order to defend your campsite when the leprechauns rush from the woods to steal your beer and Cheese-Whiz. C’mon, Benchmade. The AFCK is a “liner lock” styled folder, meaning that a portion of the liner moves in behind the rear tang of the blade when it opens in order to lock it open. There has been a great deal of discussion about the relative merits of the liner lock. Many feel that it is a more secure lock than the style which has the release on the back of the handle. At the same time, some of the tactical knife guys have managed to show that with some types of stabbing and twisting strokes, the user’s hand can release the lock. When I bought mine, the guy at the shop warned me against stabbing with it left handed. (If I’m down to stabbing someone left handed, I imagine cut fingers would be the least of my worries.) Nevertheless, if you are left handed, you should make sure you get the left handed variant of the knife. The Model 800 AFCK is one of Benchmade’s older designs, and it just continues performing well year after year. Perhaps it’s attributable to its unique erqonomic handle design which settles into your hand like a natural body extension, including the rugged G-10 scales and double 410 stainless steel liners with our modified locking-liner mechanism… Or maybe it’s the effective, utility blade style with the ambidextrous opener-hole* which lends itself to so many different applications. Whatever the reason may be, one thing we do know for certain is the fact that we build each one to the superior Benchmade standards, definitely doesn’t lessen its chances for optimum performance. And the smaller, Model 812 Mini-AFCK shares many of the same great features of the Model 800 for equally superior performance. Both models are available in the optional M2 high-speed steel if you’re looking for the ultimate edge. Each knife comes complete with a removable steel carry-clip for convenient “at-the-ready” carry. between function success and function failure is how well the locking-liner engages with the rear tang of the blade to lock the blade open. All Benchmade modified locking-liners utilize a patented radius or concave cut on the rear tang of the blade which enables the liner to “track” into a secured locked position for positive function. ATS-34 STAINLESS STEEL A high carbon alloy steel produced by Hitachi® with super-fine grain structure which bodes well for excellent lasting edge sharpness. We temper to a Benchmade “custom” toughness which has proven to offer higher than average blade strength. G-10 Developed as a circuit board material capable of withstanding extreme conditions without distortion or negative effect. A highly compressed epoxy and woven glass composite providing nearly indestructible strength and is of nominal weight. We laser cut and machine finish to final spec. G-10 is a medium weave, fabric base, high pressure glass epoxy laminate, and is about 40% lighter than aluminium. 410 STAINLESS STEEL An ideal 400 Series steel offering good corrosion resistance and workability. We laser cut material to form, machine finish to spec and heat-treat for optimum performance strength. BT2® COATING Our own proprietary blade coating is a black Teflon based polymer offering corrosion protection which exceeds the ASTM-117 specification for saltwater corrosion resistance. And due to its high lubricity, it helps make the knives operate more smoothly. COMBOEDGE™ Refers to our partially serrated plain blade configuration. Benchmade’s serration pattern offers ideal cutting ability for fibrous materials such as webbing, straps, netting or rope. HEAT-TREAT We specially heat-treat our blade steels to a “custom toughness” for Benchmade superior performance. Sometimes, it may be difficult to find a knife that would fill the role of a utility tool as well as a self defense role. For those stuck with this dilemma, Benchmade’s AFCK is the knife you should seriously consider. This knife was designed in conjunction with Chris Caracci, a former Navy SEAL team operator and instructor at Gunsite Training Center in Paulden, Arizona (A word of note, the AFCK model 800S is the official knife of Gunsite). 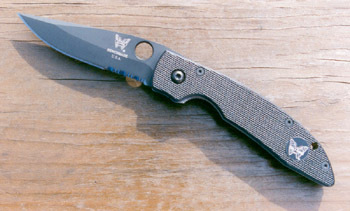 The AFCK is manufactured under license from Spyderco because it sports the blade hole. There are several features the AFCK incorporates that sets it apart from the competition. First, there is a slight curve to the knife when opened fully. This curve helps to concentrate pressure where it’s needed most — on the blade. Second, one will notice the recess in the handle, close to the pivot end. This is the key to the great feel the AFCK has in the hand. On the inside of this recess is where you will find the Locking Liner release (which by the way is serrated for a good purchase when unlocking the blade). Personally, I really like this setup. The release is seated into the handle, making it impossible to inadvertently unlock the blade. It does take some getting used to, though. Instead of putting part of your thumb onto the liner itself, you touch the bottom end of the release. Because of the serrations there, your thumb may develop a minor sore spot from repeated unlocking. Third, the blade hole makes blade deployment a snap (so to speak! ), even with work gloves on. Fourth, I discovered the AFCK’s hole is chamfered, eliminating any sharp edges. Comparing the hole with those on my SPydercos, it does not feel as harsh. Your thumb will definitely thank you for this! As for the cutting performance of the AFCK, it is one serious cutting tool. For a few weeks, I proceeded to tote it around with me, using it for those “mundane” utility cutting tasks at work and in the yard. The AFCK went through cardboard quickly, with little pressure applied to the handle (the curve of the knife comes into play here). For those of you, like myself, who have a knack for landscaping and/or gardening, this is an ideal knife to have with you out in the field. I have put my AFCK through its paces by harvesting produce, trimming vines, and opening bags of fertilizer. Again, the knife can be used with one hand, without having to pull your gloves off. In terms of self defense, the AFCK will excel in this role as well as it does utility tasks. Thanks to the handle’s recess, your hand will never slide up on the blade. This knife feels like an extension of your arm during slashing and thrusting maneuvers. Under stress conditions, you must be able to retrieve the knife and open it with either hand. The blade hole and Locking Liner simplify this task.